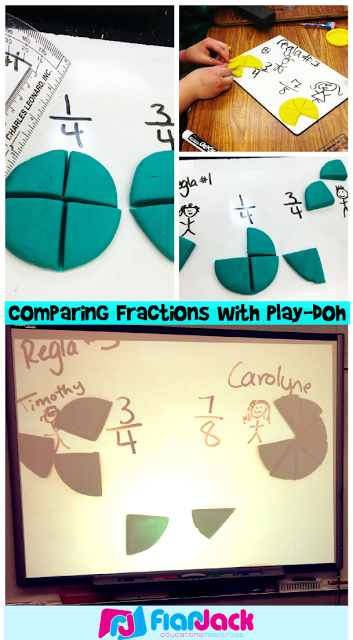 We’re still working on fractions, and I saw this cute idea on Pinterest to represent fractions with Play-Doh. I can’t find the link that inspired me, but here is my take on it. 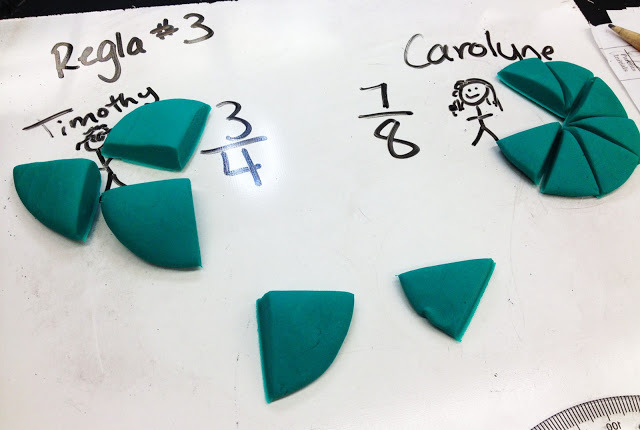 * Each student shared a container of Play-Doh with their whole-group partner. 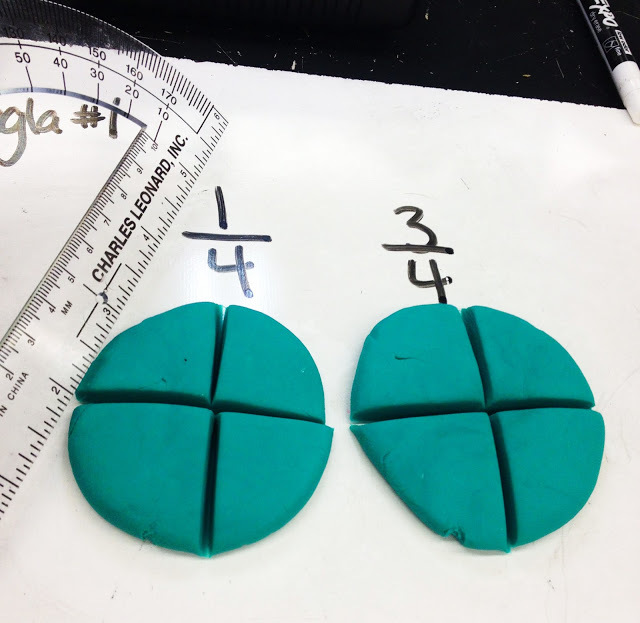 Rule #1: When the denominators are equal, the fraction with the largest numerator will be the largest fraction. 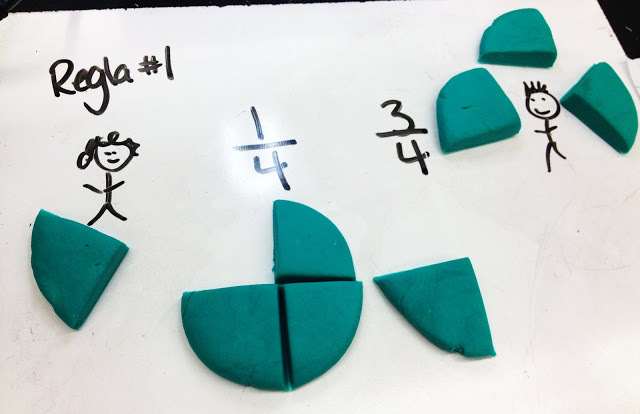 First, we wrote the fractions 1/4 and 3/4. (I stuck with denominators 4 and 8 to keep the dividing into equal parts easy.) 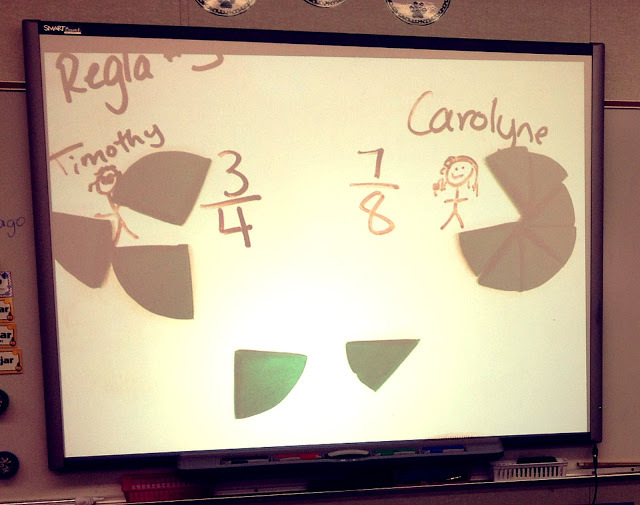 Then we made our pizzas and divided them by looking at the denominators. I then chose two students. One was going to eat 1/4 of a pizza, and the other was going to eat 3/4. I had each partner group discuss who was going to eat the most pizza and why. Rule #2: When the numerators are the same, the fraction with the smallest denominator will be the largest fraction. 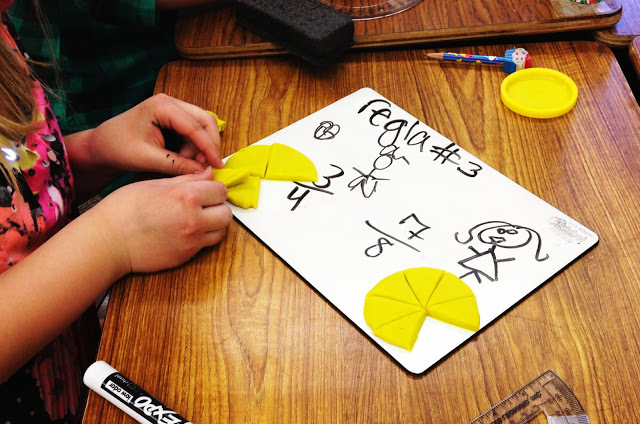 Rule #3: If the numerator is one less than the denominator in both fractions, the fraction with the larger numbers will be the largest fraction. Using the camera projector really helped to guide the lesson. I have a whiteboard actually taped under the camera that I use ALL the time. The students had a lot of fun and were very responsible with the Play-Doh. I guess Play-Doh is not just for kindergarten! And it’s so much neater afterwards with 4th graders! 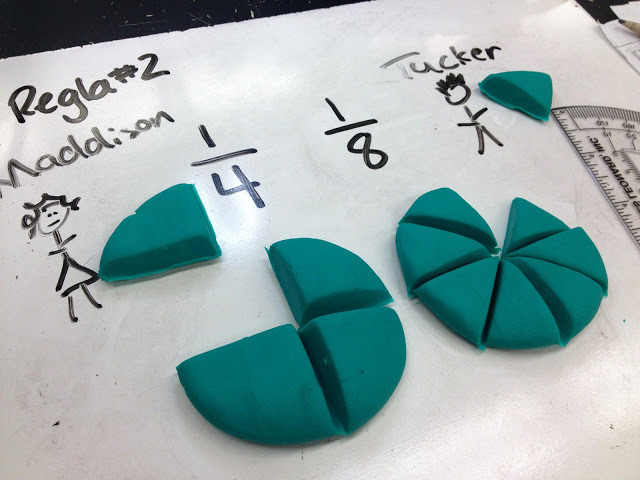 You're going to laugh when I admit that I never knew fraction rule #3! I'm a "learn by doing" person, so I tested it out and I love it. I think I might use that rule in a morning work problem tomorrow. I was thinking the same thing…in 20+ years in teaching and I never knew or taught that rule!!! I will now!!! Thanks! 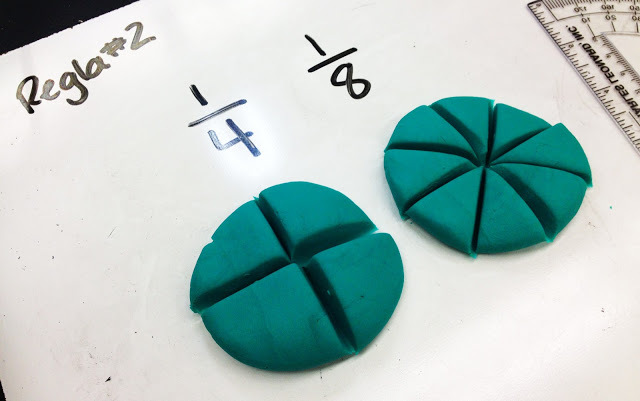 I'm doing fractions with my kids just now and love this idea! Will be trying it tomorrow to make some more real life scenarios. Thanks so much for posting this. Fractions are so difficult and using playdoh wil help. I didn't know rule 3 either! Thanks. 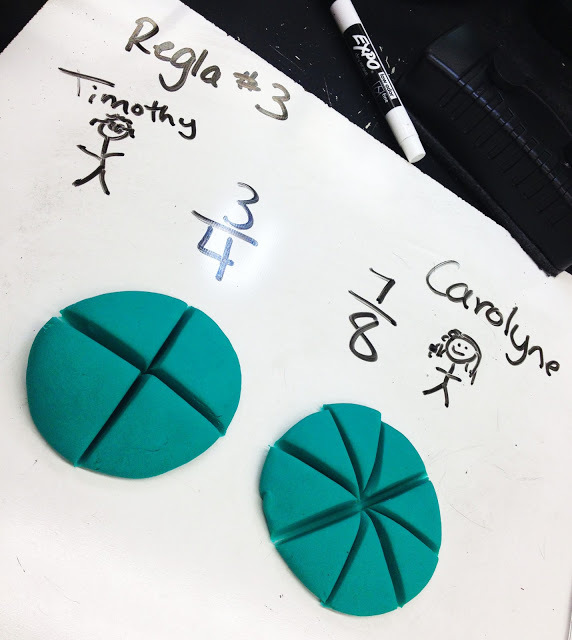 What a great way to teAch a tough concept and build number sense. It's very impressive blog for me and I also like to tell you that it's an ideal idea to invent this tutorial to learn some maths to students.